We are actively engaged in offering Celery Seed Oil made using celery which is known by the botanical name Apium graveolens. 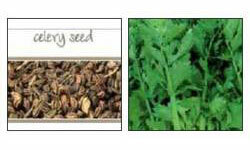 Celery Seed Essential Oil is derived from the seed part of the plant through steam distillation method. Celery is a biennial plant with a grooved, fleshy, erect stalk & skinny pennant leaves. The extract derived is Yellowish brown liquid. Celery Seed Essential Oil has antioxidant, antiseptic (urinary), anti-rheumatic, antispasmodic, aperitif, digestive diuretic, depurative & stomachic properties.